Winship social worker Kendelle Miller and volunteer and cancer survivor Bari-Ellen-Ross, are the 2018 recipients of the Robert L. "Bobby" Rearden Spirit of Winship Award. Pictured: Dell Rearden, Bari-Ellen Ross, Walter J. Curran, Jr. MD, Kendelle Miller, and Robert Rearden, III. A Winship Cancer Institute (Winship) social worker and a dedicated volunteer-leader are the 2018 recipients of the Robert L. "Bobby" Rearden Spirit of Winship Award. Kendelle Miller, a licensed clinical social worker for the Department of Hematology and Medical Oncology and the Winship Bone Marrow Transplant Unit on the Clifton campus, is the staff winner of the annual award. Bari-Ellen Ross, volunteer chair of the Winship Patient & Family Advisors (PFA), member of the Emory Healthcare PFA Council, Peer Partner, and former Winship patient, is the volunteer recipient. 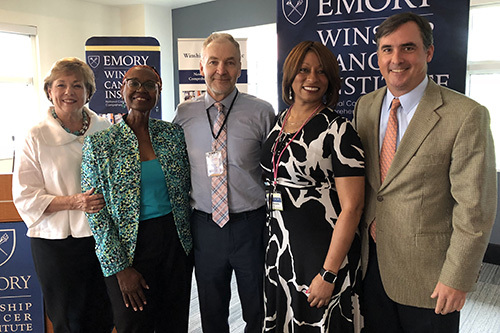 "It is a great pleasure to honor Kendelle and Bari with the Spirit of Winship Award," says Walter J. Curran, Jr., MD, executive director of Winship. "They have demonstrated exemplary service, teamwork, and a commitment to supporting Winship's values." Miller started working as a social worker for Emory Healthcare in 2008. She joined Winship three years ago. In addition to her work assisting cancer patients and caregivers, she devotes time to various civic organizations in Atlanta. Avril Phillips, a co-worker who submitted the nomination, says "Kendelle is easily the most compassionate, empathetic, and dedicated person one could know. She is the kind of person who goes out of her way to help whomever she can every single day." Ross, who was recently appointed to serve as a patient advocate on the National Cancer Institute's (NCI) Metastatic Recurrent Task Force for head and neck cancers, was inspired to give back to Winship and volunteer after being treated for stage IV head and neck cancer. She was nominated for the award by Winship's director of Volunteer Services, DaVida Lee-Williams. "Bari is not only a cancer survivor, but she is a true ambassador for Winship and its patients and caregiver population." A monetary award will be made in the name of the award recipients to an area of their choosing within Winship. Rearden served as a patient advocate on Winship's External Advisory Board which is comprised of national leaders at other NCI designated cancer centers. He also served as honorary chair of Friends of Winship and was a founding member of Winship's Community Advisory Board. He passed away in 2015 while undergoing treatment for a recurrence of leukemia.